Our products are made with the best all natural ingredients, fully vegetarian, Kosher, completely free of any sugar or preservatives and are GMO free. Designed in Los Angeles, California and made in Montreal, Canada. As a self professed flavor addict, I have always been inescapably drawn to the mystery of spices, how they stimulate the mind and rejuvenate the body. The endless summers in Provence inspired me to reinvent the age old North African staple, Harissa. 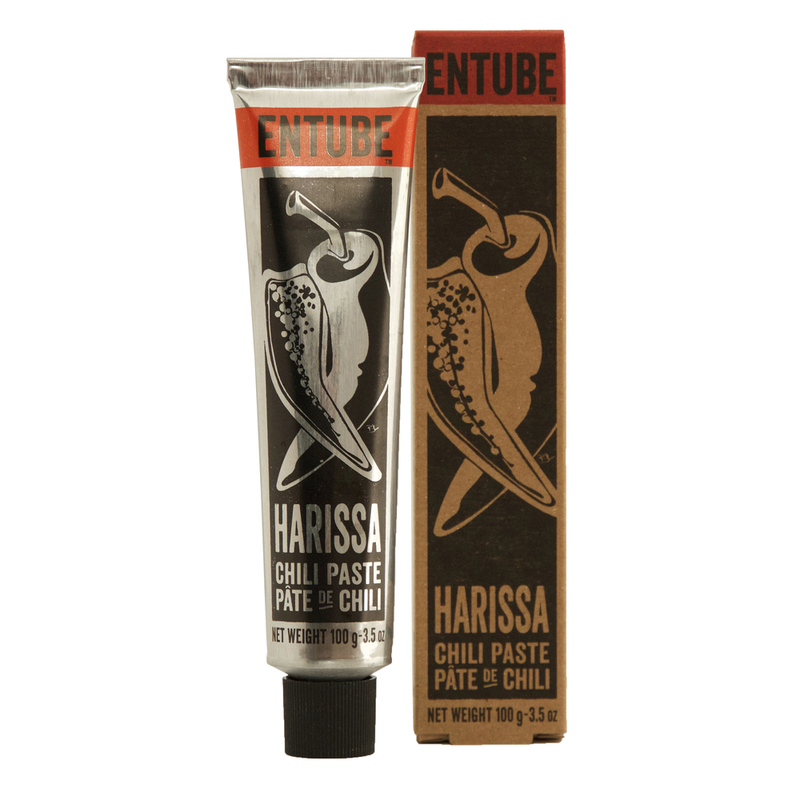 By introducing Amazonian Acerola berry and other unique ingredients, the traditional recipe has been transformed from a Mediterranean ketchup into an exciting modern flavor bomb essential to the global kitchen. Paprika, Cayenne, Sea salt, Olive Oil, Acerola Berry, Cumin, Sumac, Garlic, Coriander and Spices. Inspired by ancient recipes from the far east, I have designed this spicy paste to be the quintessential Go-To Curry flavor. The subtle complexity of flavors will ignite every taste bud in your mouth and place you on the road to culinary excellence. Start the Curry Entube experience by squeezing a little on a teaspoon and savor…… feel the flavors build and travel, this Curry has unlimited culinary potential! Cumin, Turmeric, Sunflower oil, Fennel. Onion, Jacobsen Sea salt, Garlic, Coriander, Fenugreek, Acerola Berry, Cayenne. Ginger and Spices. Entube's Cocoa Tamarind Molé was inspired by the exotic fragrances and vibrant colors of local markets in Oaxaca that make this region a 'must go' destination for all serious foodies. Molé – from the ancient Nahuatl word sauce, mōlli – is prepared throughout México in an endless array of colors and flavors. When molé recipes were originally developed in the early 19th century, the mixture of North American, European, and African ingredients made it México's first truly global dish. Ume, the Japanese plum, has been used in Ayurvedic medicine for many centuries as an alkaline balancer. By combining the Ume plum with Cayenne pepper, we have created a veritable health tonic that will explode in your mouth and open you taste buds to deliciousness...hello amazing cocktails! What we have is a salty sour all natural flavor bomb that will bring harmony and balance to your body, mind and spirit. Ume plum, Ume vinegar, Shiso leaves, Sea salt, Red Beetroot and Cayenne.